Three students of German Studies, Katie Fountain, Chris Flach and Steph King departed on a journey of the unknown and joined the German Drama Group in September 2015. During that journey, they haved experienced a new style of drama, including physical theatre, dance and movement, while improving their German language skills. After the first few months of workshops, it became clear that ideas were merging into what looked like could evolve into an innovative and entertaining performance. Having experimented with different texts and topics during the workshops, we discovered that the effects of social media and technology on society, particularly in our generation, captured our imagination. Therefore, we wanted to further explore the effects of modern technology on the individual and interactions with others through elements of dance, music, media and language. 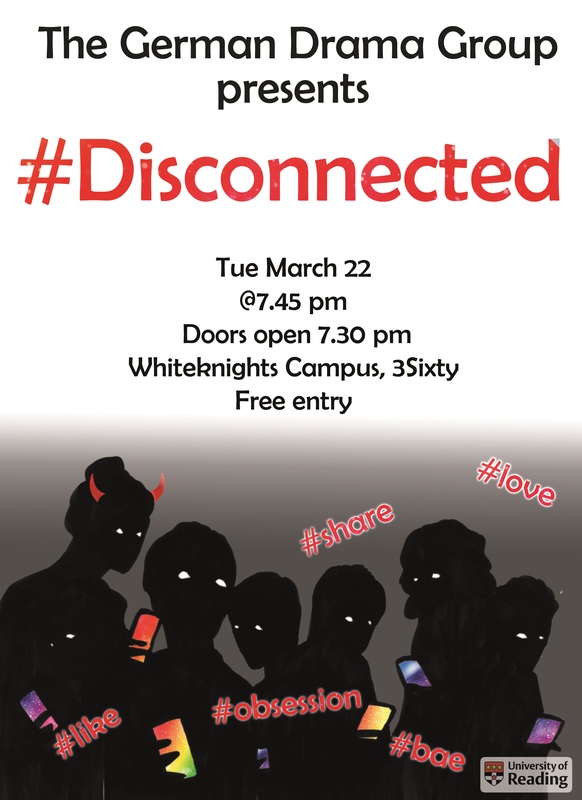 Loosely based on the story and central themes of Faust by Goethe, two individuals find themselves lonely and dissatisfied with life and searching for love in the 21st century. Pushed together by unknown forces, they soon realise that nothing is what it seems. 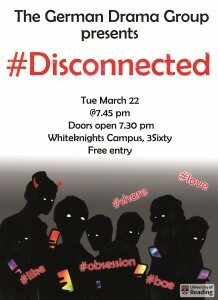 If you would like to embark on our adventure and are curious, get connected with us and come to our performance #Disconnected, which will take place on 22 March at 7.45pm in 3Sixty.